Sara offers a discount of 25% on their first / introductory lesson! I am a professional Singing Teacher with 15 years experience. I work with Adults and young people of all abilities, developing their vocal tone, range, breathing, confidence and a practice regimen. I also work on elements like keeping rhythm, ability to sing in tune (intonation). Of course it depends on each student's abilities and after the first lesson we will agree a full programme of exercises, practice sessions etc. I teach all contemporary musical genres ie. Pop, RnB, Jazz and Gospel, Indie etc. 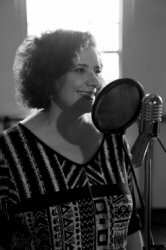 I teach from my studio based in Barnet, North London and in addition I work as a freelance singing teacher for other organisations. I studied at Goldsmiths, University of London where I gained a Post Graduate Certificate in Music Teaching and I have BAST singing teaching certificates Levels 1 and 2. My teaching approach is entirely student centred - I always ensure that my student's goals are foremost in my lesson planning and delivery. In addition to my singing teaching, I am Musical Director for two Adult Community Choirs. My own singing experience is with Jazz/Pop groups, Gospel Choirs and Jazz Choirs and have performed at many of London's major event venues as a solo artist and with groups. I have been teaching singing and music for 15 years. I teach all contemporary musical genres working with people form the age of 14 upwards, teaching privately and also in small groups and I have experience of leading choirs. I also have experience working with young people with various special needs, using music as a medium for self expression and creative outlet. I work with community groups running singing, improvisation and performing workshops and sessions. I always conduct a full vocal assessment at the first lesson and find out whether a student wishes to pursue singing in a professional capacity, for their own personal development, as a hobby or maybe for a specific event eg. singing at a wedding etc. My lessons are structured to develop techniques to address: Posture, breathing & support, phonation, resonance, articulation and artistry and performance (if relevant). I also teach the Rockschool Graded Singing syllabus up to grade 4. SaraFrom Jazzy (5/5): Sara is a phenomenal tutor! I have absolutely loved her lessons. She is incredibly professional, experienced, knowledgeable and makes the whole learning experience hugely enjoyable! She teaches with passion, patience and radiance. I highly recommend her to anyone looking to improve their singing and general knowledge! Reply from: Sara: Thank you so much for your kind comments Jazzy! You are a highly talented Singer/songwriter and I am privileged to be working with you. I’m so looking forward to being part of your vocal journey! SaraFrom Jem (5/5): Sara is a true professional who blends theory & practice in a perfect way. Ive been so impressed with her approach, my confidence and learning continues to grow. Highly recommended and very fortunate for some one of Sara's calibre to offer singing lessons so local to me. Reply from: Sara: Thank you Jem for your kind comments. I’m really enjoying working with you! Reply from: Sara: Thank you Mulenga! SaraFrom Leah (5/5): Sara is utterly brilliant, can't rate her highly enough. Incredibly professional and knowledgeable whilst also being friendly and encouraging. Reply from: Sara: Thank you Leah! I'm really enjoying working with you and being a part of your vocal journey- you do have a lovely voice! SaraFrom Mirka (5/5): It is clear that Sara has a passion for singing and transmits this in the way she teaches. She is very good at making people feel comfortable and makes the lessons enjoyable. For a mature student, with no intention to apply for X-factor it was important to find someone who understood my personal objectives. Excellent teacher who is attentive, supportive and also has a lovely singing voice! Fully recommend. Reply from: Sara: Thank you Mirka. I am really looking forward to working with you and supporting your journey of vocal development!